Hakusan Shrine is a small local shrine right in the centre of Bunkyo-ku, the Tokyo ward famous for its many universities and historic places. While small, this shrine received support from the ruling shoguns in the Edo period (1603-1868) and was selected as important shrine at the start of the Meiji period (1868-1912) receiving support from the emperor. Furthermore, the founding father of the Republic of China, Sun Yat-sen, received the final incentive here to start a revolution in China by way of comet Halley. 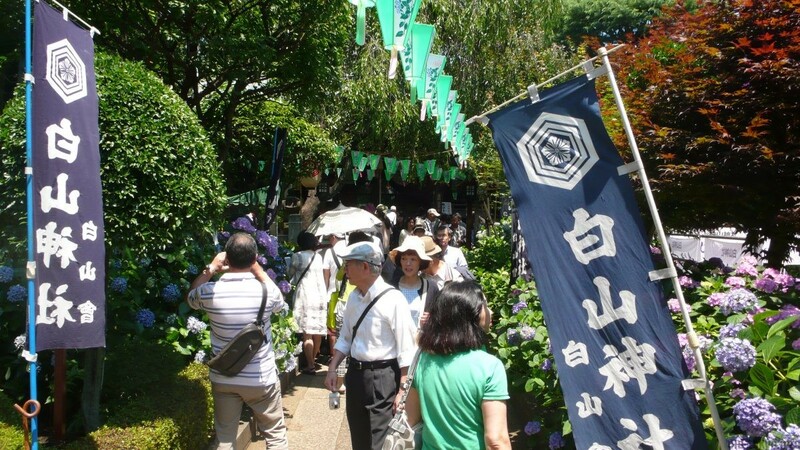 And last but not least, it is home to Bunkyō Ajisai Matsuri, the major hydrangea festival in central Tokyo. Hakusan is a quiet neighbourhood with many showa-style coffee shops (no Starbucks or any other coffee chain to be found here), all overshadowed by the presence of Toyo University and the Koishikawa Botanical Garden. Hakusan Shrine was founded in 948 (moved to its current location in 1655), and is part of “The 10 Jinja of Tokyo”, a grouping of 10 major shrines. In 1868, at the time of the Meiji Restoration, Emperor Meiji chose 10 shrines throughout the city that became sanctuaries for the new capital. 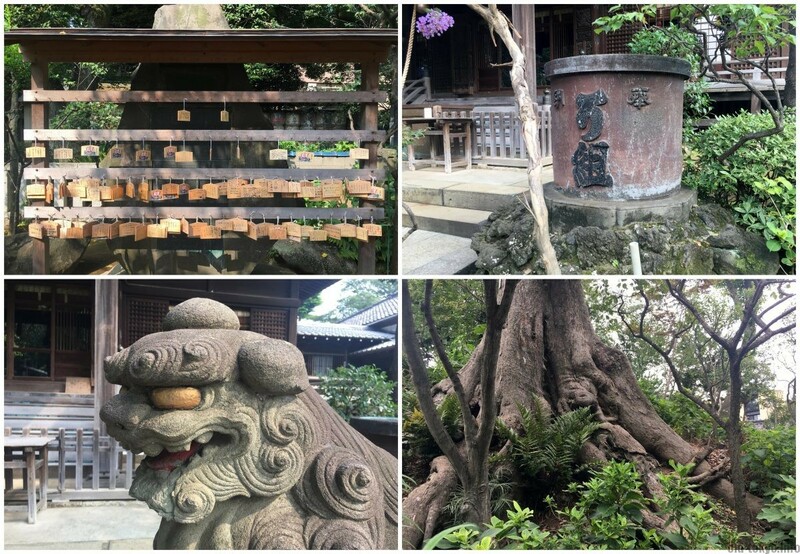 These 10 shrines are a grouping of all the major shrines, with the big exception of Meiji Shrine (but that one was not yet around in 1868 as it is a shrine dedicated to the Meiji Emperor after his death). The shrine is named after Mount Hakusan (literally white mountain) in Ishikawa prefecture close to Kanazawa, one of Japan’s most sacred mountains. The shrine was popular with the ruling shoguns due to the place where it is located. 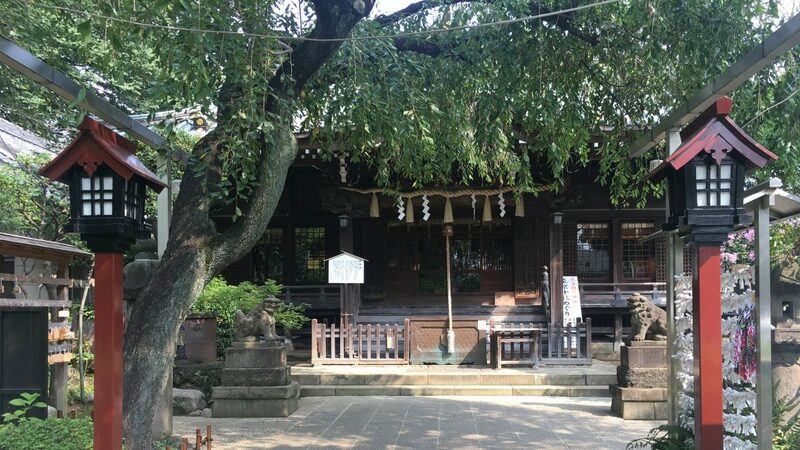 The shrine was originally inside Koishikawa Botanical Garden, the place where the 5th Shogun Tokugawa Tsunayoshi (in office 1680–1709) built his mansion and as a result of that more or less random connection the shrine received support from the shoguns from that time onwards. A shrine is nothing of course without its kami (deities) that are worshipped. 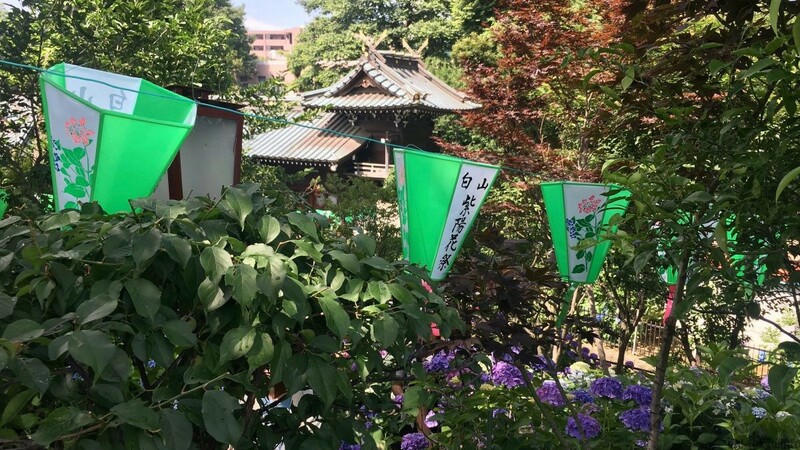 People go to Hakusan Shrine for two things: marriage and toothaches, an interesting combination. Kikurihime, the goddess of marriage, is worshipped here and the shrine is therefor hailed as a power-spot for love. According to legend, Kikurihime mediated in a fight between a married couple (of gods) in the next world, hence praying to this god will help particularly to mend a relationship if there is trouble between the partners. More in general, praying to this god could also help to fix discord between family members and friends. The toothache story is more difficult to link, one theory claims that an empress got rid of her toothache after coming to this shrine, another theory puts the connection in a play of Chinese characters (歯苦散 is pronounced hakusan, meaning disappear tooth pain, the characters for this location are different though: 白山). Whatever the theory, in the Edo period this shrine apparently became known for alleviating a toothache. In those days that was a serious issue and it is easy to understand why people were looking into the religious corner for relief. Hakusan Shrine played along and started awarding toothpicks to people who came to pray for dental problems. These days it is possible to hold a service for your toothbrush. If you want, you can deposit your used toothbrush into a box (only during the Ajisai Matsuri in June), and then a service will be held. 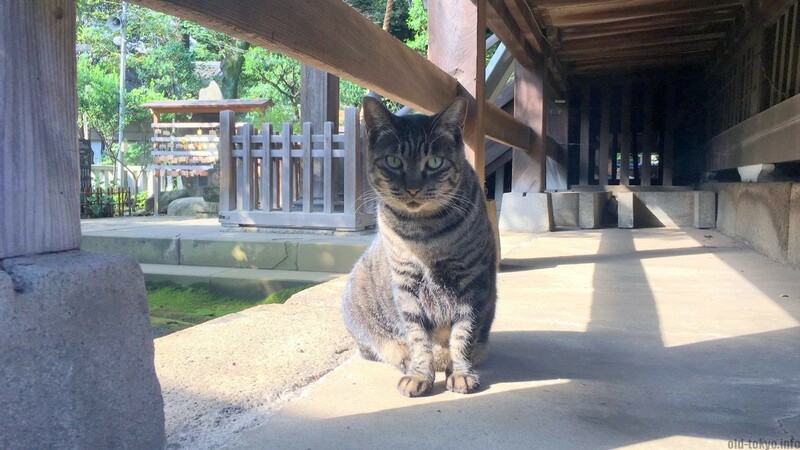 Hakusan Shrine is one of those shrines where cats are plentiful, especially in the morning and the evening many cats are inhabiting the shrine grounds. They roam in between all the bushes and mikoshi kura, storehouses for portable shrines. There are in total 14 of these storage houses, a sign that this shrine has indeed a long history and is rather important. Once a year in June the shrine attracts a lot of visitors, including many foreigners, for the Bunkyō Ajisai Matsuri (hydrangea festival). Be aware though that the shrine gets packed with people during this festival, so if you want to avoid the crowds for a quiet shrine visit, best to avoid June. There is one final history related element linked to this shrine. A stone monument was put here for Sun Yat-sen, founding father of the Republic of China. The story goes that while in Japan, he saw the comet Halley at Hakusan Shrine in 1910 and this spurred him to start the revolution in his homeland. Sun Yat-sen spent several years in exile in Japan, even married a Japanese girl. He found support for his revolutionary ideas in Japan out of shared pan-Asian fear of encroaching Western imperialism. In 1910 he stayed at the home of Miyazaki Toten, who lived close to Hakusan Shrine. Note there are two entrances for Hakusan Shrine, if you come from the station, the closest one is the side entrance and in fact this is the one that most people use. However, you can also use the main entrance that brings you straight to the front. Unfortunately, you will also have to cross a rather ugly parking lot if you take this route.